SRLP Congratulates Laverne Cox on an Emmy Nomination! SRLP sends HUGE CONGRATULATIONS to Laverne Cox on her Emmy nomination for her performance in “Orange Is The New Black”! Thank you, Laverne, for all of your powerful work to lift up the voices and experiences of trans women of color! We are so grateful to be in this movement with you! Check Out the 2013 SRLP Annual Report! 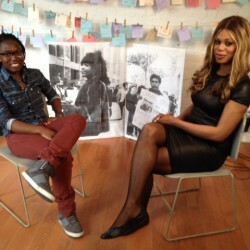 Watch Alisha Williams, CeCe McDonald and Laverne Cox on Democracy Now! This morning SRLP’s Director of Prisoner Justice Alisha Williams joined CeCe McDonald, and Laverne Cox on Democracy Now! to talk about CeCe’s case and the work our communities are doing to end criminalization and create trans liberation! Watch below!